Beverly Jean Campbell (McDonough), 77, was born in Hollywood, CA January 1, 1936 to Myrtle Smith and Warren Downs McDonough. For the past 40 years she lived in Mesa, AZ and passed away January 9, 2013 after struggling for more than 30 years with Parkinson’s Disease. She is survived by her husband of 58 years Donald Campbell and 3 children, Donna, Diane and Brett. She also has 8 grandchildren, Brice, Chris, Nick, Terran, Brookelyn, Madison, Brayden, and Jordyn. She was a very faithful member of the Church of Jesus Christ of Latter-day Saints and was always a good example to everyone. She will be dearly missed. 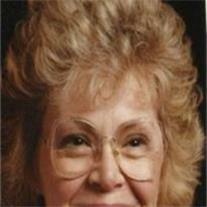 Visitation will be Saturday, January 12, 2013 from 10-11 AM at Bunker’s Garden Chapel, 33 N. Centennial Way in Mesa. In lieu of flowers, donations may be sent to the Parkinson’s Foundation, www.parkinson.org.